Rose likes to provide flexibility in her tours. In many cases, elements of one tour can be substituted by elements of another, in line with your interests. Up to five passengers can travel in comfort and style in Rose’s 2016 Kia Carnival. All rates include entrance fees and refreshments, including lunch on a full day tour, and fish’n’chips or a casual dinner on twilight tours. History and architecture in Parliament Buildings, the Beehive, and Old St Paul’s Cathedral. Choose the experiences from the full day tour that are of most interest to you. Lunch not included on this tour. Tastings at four of Martinborough’s top wineries, and lunch. Rangiātea Church in Ōtaki, the oldest Māori Anglican church in New Zealand. Walk on a wild West Coast beach (time and weather permitting). Paekākāriki Station Museum, of particular interest to US visitors. A wine tasting at one of Martinborough’s leading wineries. A spectacular view of Wellington city on the return trip. 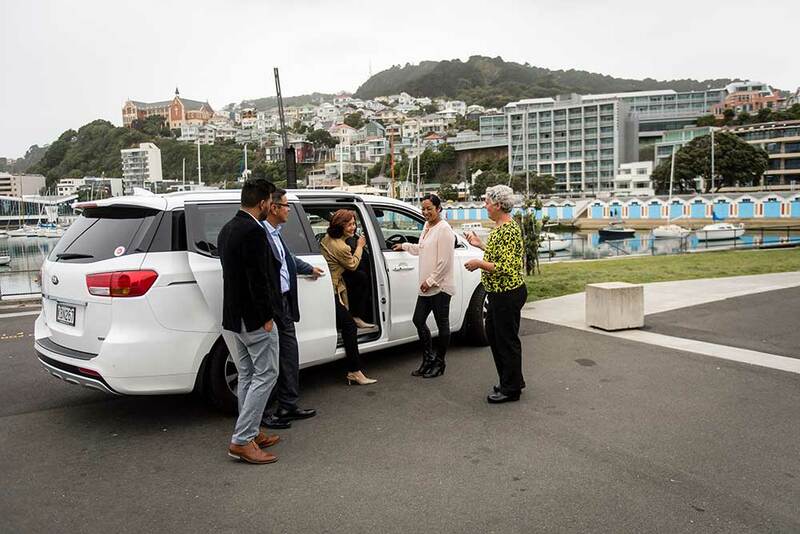 Experience the magic of Wellington in the evening light: the views, the coastline, and the lights of the city, rounded out with a tasty fish’n’chip dinner* and, once the sun has set, a wonderful glow worm experience. *Vegetarian options available.